The Blogosphere … A Great Place! As writers, we’re works in progress, always writing as much as we can. Books about writing fill our book shelves. We’re also always reading as much as we can. Novels and anthologies crowd those same book shelves. We’re always learning, trying to create characters and a story our readers will care about. 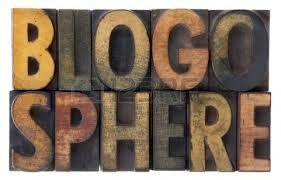 The blogosphere is another great place we can go to learn about writing. I’m not talking here about doing internet research on the craft of writing or doing research for a writing project. I am talking about the rich selection of writing on blogs that we just plain enjoy. It’s the varied voices, tones, and styles. It’s the blogger’s approach, from fun to serious to outrageous to gentle. And as I read, I’m asking myself … what’s attracting me, what’s making the experience so enjoyable? Definition by Merriam-Webster of blogosphere: all the blogs on the Internet as a collective whole … Wow! http://infinitefreetime.com This blogger gives a saucy and irreverent look at life, teaching, and writing. http://fredcolton.com I enjoy the tongue-in-cheek style as he describes the adventures of an expat living in Asia who teaches and writes. http://bottledworder.com This blogger always leaves me thinking. I find the content thought-provoking. http://headinmyhands.com These posts are written with such heart and compassion, I feel touched by the humanity of them. http://cyndymuscatel.wordpress.com On the blog called “A Corner of My Mind,” this blogger takes a look at life, sometimes quirky, sometimes heartfelt, sometimes philosophical. And finally I like http://gwenniesgarden.wordpress.com On a feature called Wordless Wednesdays, the writer posts a great picture from her garden. No words. Just a chance to pause, breathe, and enjoy. While I’m reading these blogs, I’m noting the entire experience. The whole visual and ease of use. The layout. The graphics. The photography. But mostly, the individuality and uniqueness of the writing and of the voice. All I can say is, Thank you to all the many bloggers out there. You set a bountiful table. I know I’ll continue discovering blogs I enjoy reading. And I’ll continue appreciating the work of the blogger. Think about it. Do you have a favorite blog(s) you like to visit simply because it gives you pleasure and you enjoy the writing? This entry was posted in Finding Ideas: The Creative Process, Inspiration, Looking for Inspiration, Reading, Writing and tagged blog, blogger, blogging, creativity, ideas, imagination, inspiration, writing, writing style, writing voice. Bookmark the permalink. 4 Responses to The Blogosphere … A Great Place! Thank you for an inspiration. Hey Carol, you are a generous soul. Thank you for your contributions to keeping the blogosphere beautiful. Thank YOU, Susan. Your posts always touch me.